In the last few days there were several changes and enhancements on TSViewer. Here are the details. Now you are able to integrate TSViewer perfectly on your site with PHP Include without colliding on problems or bugs. For all those, who always wanted to hide the annoyance scrollbars can do this now. Server which are offline for a longer time period will not be longer deleted after 10 days. It needs now 30 days offline time till a server get set to inactivity status (it will be not deleted); you can reactivate it. His efforts in the last days, weeks, months and even years have characterized the TSViewer and made much things first possible and revised others. Thanks for the numerous training hours in TeamSpeak and pretty often night-time VNC sessions. He is always helpful and available e.g. in TeamSpeak.com forums, on his page PlanetTeamSpeak.com and on TeamSpeak-Einstieg.de. Who search for TeamSpeak Third-Party-Tools as the TS Admin Client, TS Perlmod or others or wants to talk with component people about TeamSpeak and his tools will feel very comfortable on PlanetTeamSpeak.com. Here you will find the big names of the TeamSpeak tools scene. You can exchange with them e.g. when you want to programm your own tool for TeamSpeak and more. As well i want to say thanks again to Michael "Linuz" Dukaczewski from CSS-Clan.de for his time and work in the last months and even years. 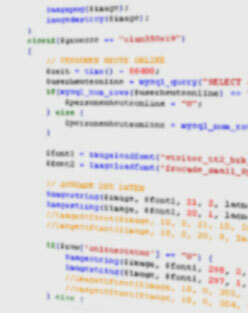 Without his efforts and knowledge in PHP, JAVA, MYSQL and Linux would be many things not possible. Absolutely essential friends. Thanks! Enjoy the new TSViewer.com experience.